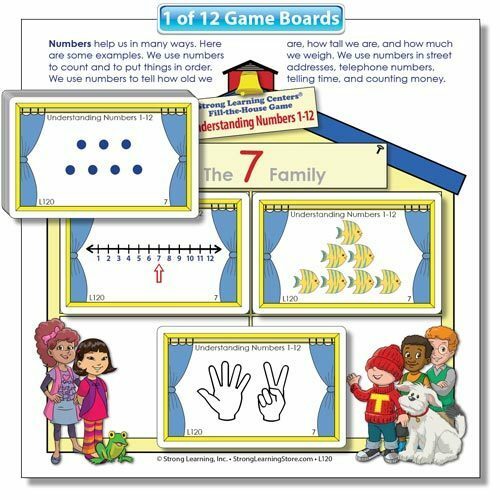 Kids learn the meaning of numbers by "filling the houses"! Similar to "bingo" and "lotto," playing the Understanding Numbers game is purposeful, playful practice designed to help kids learn important early math concepts. Players use four different representations of each of the numbers 1-12 to fill the numbered houses. In no time at all, simply by playing, kids learn that numbers represent "how many" or "how much". Before moving on to addition or subtraction, it's essential that that they understanding that "five blocks" can be represented by 5 and "seven fish" can be represented by 7. In addition, seeing these numbers on a number line helps develop the concepts numerical size and numerical order, also needed before beginning addition, subtraction, multiplication and division.